Here in France, a survey by the polling agency Elabe found that almost three-quarters of French voters approved of the protests, and that more than half of those who voted for Mr Macron support them. The scales, it seems, are falling from the eyes. And for the unelected everywhere, the signs are disturbing: the Gilet movement has spread to Italy and – would you believe? – Belgium.​..
​The fact is, taxes keep having to rise – and access to citizen monies made easier – because the global recovery is a myth. High stock prices owe far more to QE than underlying economic health….and to complete the use of élite brass neck, the money invested in QE with taxpayers’ money is treated as economic growth by the central bank statisticians. Is that a lulu or is that a lulu? 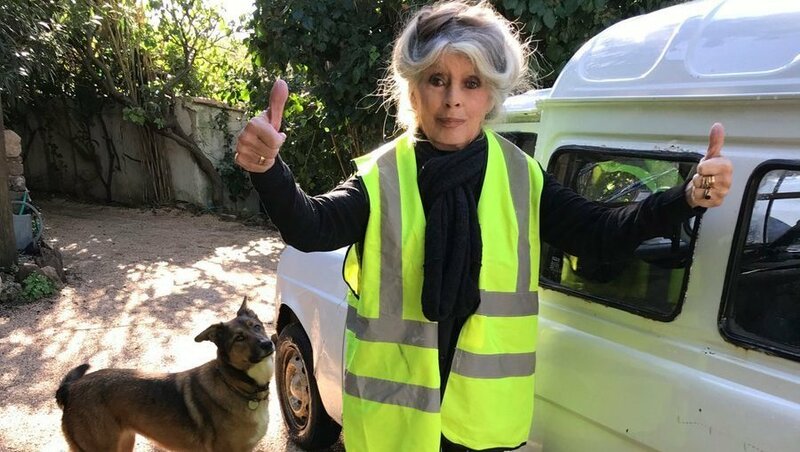 Brigitte Bardot supports the Yellow Vests, and posts a picture of herself wearing one, Thanks Tom. Global finance is even taking notice! Wigs sends this Left-Analysis of the case against (cheap-labor-without-rights) "Open Borders". If open borders is “a Koch brothers proposal,” then what would an authentic Left position on immigration look like? In this case, instead of channeling Milton Friedman, the Left should take its bearings from its own long traditions. Progressives should focus on addressing the systemic exploitation at the root of mass migration rather than retreating to a shallow moralism that legitimates these exploitative forces. This does not mean that leftists should ignore injustices against immigrants. They should vigorously defend migrants against inhumane treatment. At the same time, any sincere Left must take a hard line against the corporate, financial, and other actors who create the desperate circumstances underlying mass migration (which, in turn, produces the populist reaction against it). Only a strong national Left in the small and developing nations—actingin concert with a Left committed to ending financialization and global labor exploitation in the larger economies—could have any hope of addressing these problems. "​For some time I have been disturbed by the way CIA has been diverted from its original assignment. It has become an operational and at times a policy-making arm of the Government. This has led to trouble and may have compounded our difficulties in several explosive areas. The article appeared in the Washington Post’s morning edition, but not the evening edition.​.. The timing and tone of the letter may have been hints that Truman thought the CIA was involved in Kennedy’s assassination. If he did, he also realized an ex-president couldn’t state his suspicions without troublesome consequences.